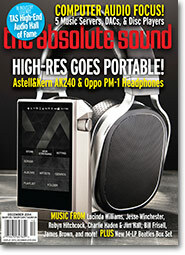 In this issue you'll find a special feature inaugurating what I think is one of the most important initiatives in The Absolute Sound's history—creating a high-end audio Hall of Fame. With all the dazzling technological advances that bombard us daily, it's easy to overlook the individuals who, through technical genius or business acumen (or a combination of both), created the foundational technologies and iconic brands that we take for granted today. All the inductees into the Hall of Fame share a common trait; they created, often from blank sheets of paper, designs or products that simply didn't exist before. They pushed forward the state of the art in an attempt to make reproduced music sound more like the real thing. The stories behind those efforts are rich and fascinating, and populated by brilliant and sometimes iconoclastic pioneers. We want to recognize their contributions and celebrate their great achievements. The High-End Audio Hall of Fame was long overdue. Some of the men you'll read about are virtually synonymous with high-performance audio—Saul Marantz, Frank McIntosh, and David Hafler, to name a few. But not every Hall of Fame inductee built an empire bearing his name; we've included lesser-known individuals whose technical contributions are seminal but no less important. It's interesting to consider which of today's young designers and company founders will be remembered fifty or a hundred years from now as trailblazers on the scale of Edgar Villchur or Raymond Cooke. To create an appropriate foundation on which to build our Hall of Fame in the coming years, the TAS editorial staff has selected 18 individuals for inclusion in the inaugural round. In subsequent years we'll invite a panel of industry leaders to nominate and vote on inductees. A special section of our website will be devoted to the Hall of Fame, with profiles of all the honorees, archival photos, and a section for you to weigh in with your comments. I've long held a parallel dream—a museum of high-end audio. I envision a place that showcases the industry's pioneers and iconic products not just through static exhibits of products and photos, but also through interactive displays that bring to life the technology and individuals who have made possible the miracle of being able to enjoy music whenever we want. The museum would reveal how the many apparently disparate advances were woven into the single thread of advancement in fidelity. There's such a museum for musical instruments, the Museum of Making Music, that happens to be five minutes from my home. It's a model of how a small museum focused on a single topic can engage and enlighten. A high-end audio museum, unfortunately, is unlikely to come to pass because it could never be financially self-supporting. Such an institute would need a benefactor for initial funding and an endowment to keep it sustained. (The Museum of Making Music is supported by the local community through fundraisers, as well as by the trade group the National Association of Music Merchants [NAMM]). On a not unrelated subject, we're on track to release the second volume of our large-format book series, The Absolute Sound's Illustrated History of High-End Audio, in October, 2015. This second volume, following the first book on loudspeakers, will showcase the iconic electronics companies, the brilliant amplifier designers, and the most significant amps and preamps in high-end history. All of us who worked on the first volume have been extremely gratified by the positive response to the book, and are eager to share with you more behind-the-scenes history in the second volume. If you haven't checked out The Absolute Sound's Illustrated History of High-End Audio, Volume One: Loudspeakers, you can get a guided video tour of the book from my listening room at TASbook. Finally, I'd like to welcome Jeff Wilson as The Absolute Sound's new Music Editor. Jeff's name will be familiar to readers; he's been a mainstay of our music section for nearly five years. Outgoing Music Editor Mark Lehman has done a superb job of transforming our music section into what it is today. Mark is cutting back on his workload, and is happily passing the reins to Jeff, who happens to be his good friend and neighbor. If you've read Jeff's superb features and reviews, you'll know that he brings to TAS an encyclopedic knowledge of music coupled with a gift for language. The latter isn't surprising; he holds a Master's Degree in English and has been a college lecturer on that subject. As the magazine's page count has steadily grown, I've allocated even more space to music reviews and features. I look forward to watching Jeff put those pages to good use in bringing you the high end's most insightful and authoritative music coverage.